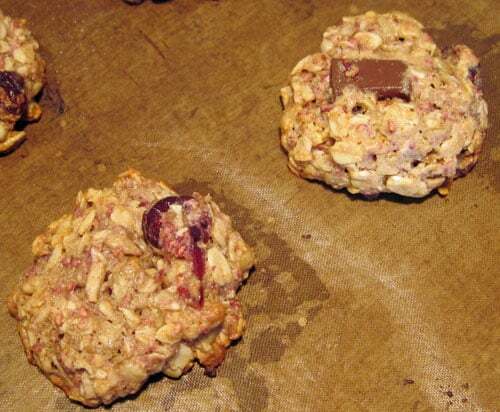 Here's a tasty cookie recipe that's loaded with fiber and healthy fats, plus it uses no refined sugar. Best of all, it's delicious! You just might be tempted to have these for breakfast instead of dessert, especially if you're a granola lover. I always hated tossing the leftover raspberry puree/pulp when I made raspberry jelly or a smooth raspberry sauce. The Berry Health Benefit Network states that “The oil from raspberry seeds is rich in Vitamin E and Omega-3 fatty acids”. Can't let something like that end up in the compost! I save and freeze my raspberry pulp in 1/2 cup packages for this recipe. You could also substitute 1/2 cup crushed raspberries and add a bit more flour, or use freeze dried raspberries, or use raspberries that had been frozen, thawed and drained. The original recipe I adapted suggested sesame seeds or flax seeds, but I really like the “extra something” that raspberries add to the flavor. 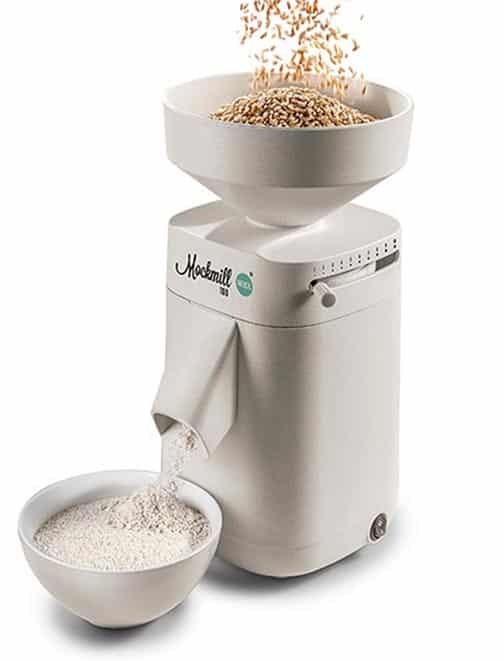 Note: If you want to use fresh ground flour, I recommend the Mockmill 100 home grain mill. It doesn't take up much counter space, is pretty quiet, and doesn't heat up the flour like some other grain mills. 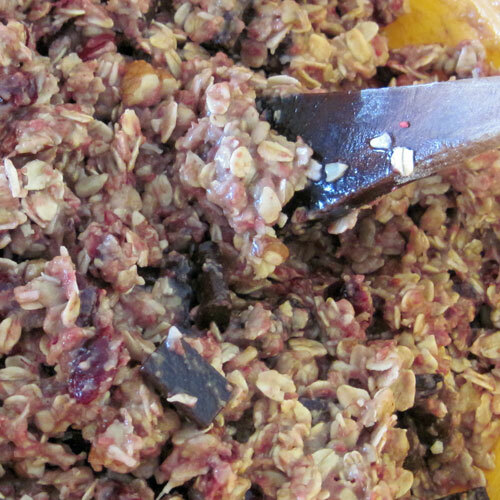 In a large bowl, combine dry ingredients. In a medium bowl, combine wet ingredients (I use my large Pyrex measuring cup). Having all ingredients warm or at room temperature will help keep the coconut oil from firming up too soon and getting lumpy. Pour wet ingredients into dry. Blend well. If dough is too sticky, refrigerate to firm it up for easier handling. Form into 1 – 1 1/2 inch balls and place evenly spaced on a cookie sheet. Flatten cookies slightly before baking. Cookies will spread only a small amount. 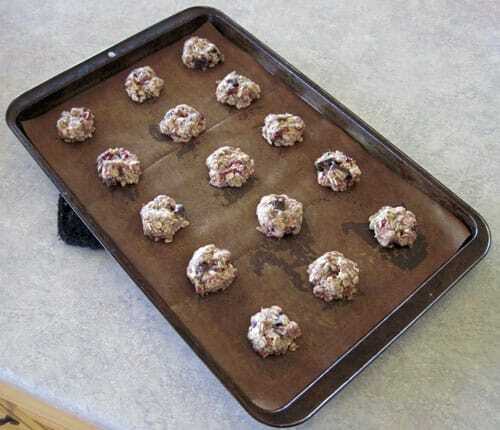 Bake at 375 degrees F for 10-12 minutes, until cookies are soft set and bottoms are lightly browned. Cookies will firm up as they cool. Makes around 40 large cookies (1 1/2 to 2 inch) or 60 smaller cookies (1 to 1 1/2 inch). As you can see, these cookies are LOADED with goodies. I like to use a mix of nuts and leave them in fairly large pieces. 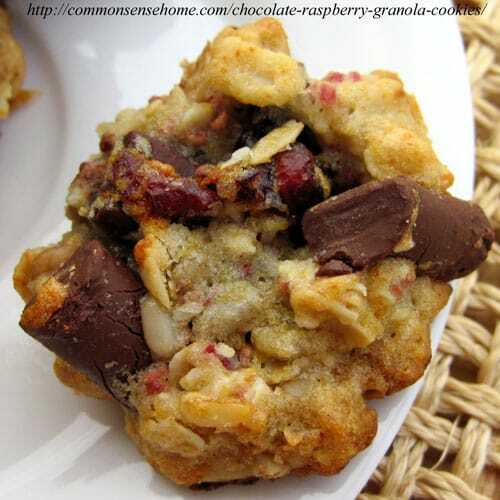 Both cranberries and cherries blend well with the raspberry/chocolate flavor combination. I prefer chocolate chunks over chips in this one because of the other large ingredients pieces, but both are good. 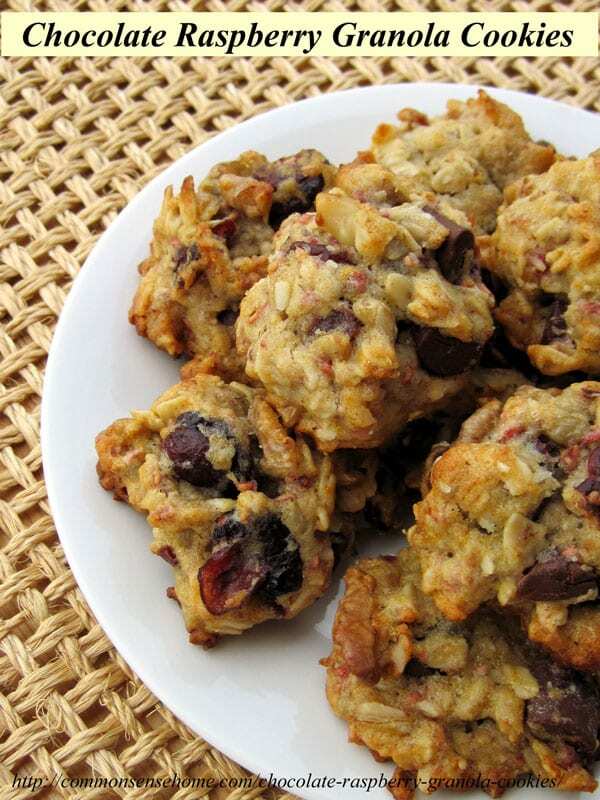 A tasty cookie recipe that's loaded with fiber and healthy fats, plus it uses no refined sugar. Best of all, it's delicious! In a medium bowl, combine wet ingredients (I use my large Pyrex measuring cup). Have all ingredients warm or at room temperature. This will help keep the coconut oil from firming up too soon and getting lumpy. Pour wet ingredients into dry. If dough is too sticky, refrigerate to firm it up for easier handling. Form into 1 – 1 1/2 inch balls and place evenly spaced on a cookie sheet. Bake at 375 degrees F for 10-12 minutes, until cookies are soft set and bottoms lightly browned. Cookies will firm up as they cool. Flatten cookies slightly before baking. Cookies will spread only a small amount. I like to use a mix of nuts and leave them in fairly large pieces. 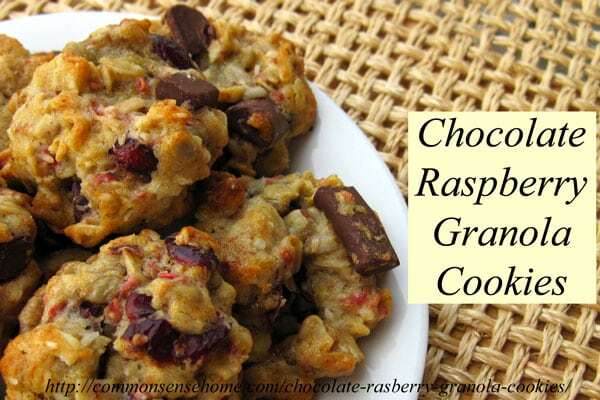 Both cranberries and cherries blend well with the raspberry/chocolate flavor combination. I prefer chocolate chunks over chips in this one because of the other large ingredients pieces. If you don't have raspberry pulp, you could also substitute 1/2 cup crushed raspberries and add a bit more flour, or use freeze dried raspberries, or use raspberries that had been frozen, thawed and drained. These look FANTASTIC! Can’t wait to make them! They are addictive! I hadn’t made them in a while, and today I’m having a hard time avoiding munching on them. I may have to freeze some for later. Can blackberries or blueberries be used also… these look so yummy!!! Sure, I don’t see why not. The texture will be a little different, but if you don’t mind the bigger seeds from blackberries, it should be just fine. bake these in a mini muffin tin = perfect bite sized treat, ideal for the kids’ lunch! Just made these. They are so flavorful and full of goodness! Thanks for sharing this recipe. Glad to use those nutritional left over raspberry seeds from making jam.